Makerversity powers a community of emerging maker businesses, shaping the future through pioneering creative experiments and collaborations. This year’s showcase part of London Craft Week explores intersections between traditional craft techniques and emerging digital technologies. How can we recode the relationships between the digital and the handmade, as a means of expanding upon whilst preserving contemporary craft? Member-led demonstrations include discovering Heleen Sintobin’s vegetable tanned leather pieces using digital processes, participating in interactive performances of Jacob Boast’s experimental wire-forming practice, and discussing the potential of automated processes in textile design with Kniterate and wearable tech with Adrienne Jacobson. Encounter Common Works’ conceptual experiments merging the digital and the handmade, as well as Abbie Adams’ use of 3D-printing to shift our perception of traditional craft. Following their courtyard installation during London Design Biennale 2018, Studio INI will tour us around their Vault discussing how you merge glassblowing with automation. Heleen Sintobin is a Belgian furniture design, currently undertaking an MA in Design Products at the Royal College of Art. Inspired by traditional and future making methods, her work strives to convey the power of materials in a contemporary design context. In this session, she presents her research around postdigital artisanship using CNC (Computer Numerical Control) machinery exploring digital crafting in leathercraft and ceramics. Jacob Boast creates products allowing for new interactions with making processes, exploring how human agency and control through motion can be built into digital making technologies. Join us for his performative demonstration of ‘Wable’, an experiments spatial wire forming project sensing and interpreting users’ movements to produce corresponding trails of wire. How we can evolve digital making technologies to be more collaborative and responsive to human input? Kniterate is an affordable and compact knitting machine turning digital designs into knitted garments automatically. Simplifying the creative process of designing and making knitwear, join Kniterate in showing the machine in action and exploring current and future potential for a zero-waste and custom-made approach to textile design. Common Works is a design and technology studio exploring the nature of playful interaction in making alongside critical design thinking. Encounter their past, present and future digital craft projects such as ‘Miko’, exploring the process of creating traditional objects with embedded data merging the digital and the handmade, and ‘Recounted’, a collaborative artwork commissioned by the V&A with Knyttan which captured singing as part of an installation and converted it into Scottish-inspired knitting patterns. Adrienne Jacobson is an art and innovation educator who passionately merges science, technology and art in her classroom and her own designs. Her “Pulse Dress” merges embroidery, beading and electronics to sync LED lights to the wearer’s heartbeat. Abbie Adams is a London-based designer exploring the importance of craftsmanship in an age of fast production and consumption, shifting her research away from emphasis upon direct functionality and enable others through engaging through systems of interaction. Her project ‘21st Century Craft’ experiments with additive manufacturing to galvanise traditional craft practice, using 3D printing as a tool for the preservation of craft practice. Learn how to create your own LED-wearable tech with textile and wearable tech educator Adrienne Jacobson inspired by her ‘Pulse’ LED Dress, using LEDs responding to your pulse. Nassia Inglessis is a Design Engineer based in London and Athens who founded Studio INI as an experimental design studio with a human centric approach to explore matter in the context of cognition. Nassia and the designers of Studio INI are naturally driven to design at the forefront of science and engage through art, across the working themes of matter, mind and nature. 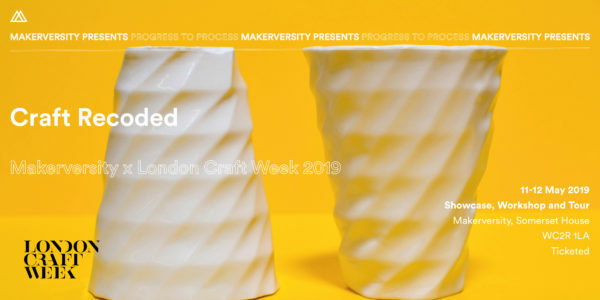 Join us on a tour of Studio Ini’s Vault space at Makerversity and practice exploring the boundaries between the automated and the handmade through their project ‘In Need of Transformation’, coupling craft with automation in the glassblowing process.